This paper presents work in progress on artificial intelligence in medicine (AIM) within the larger context of cognitive science. It introduces and develops the notion ofemergence both as an inevitable evolution of artificial intelligence towards machine learning programs and as the result of a synergistic co-operation between the physician and the computer. 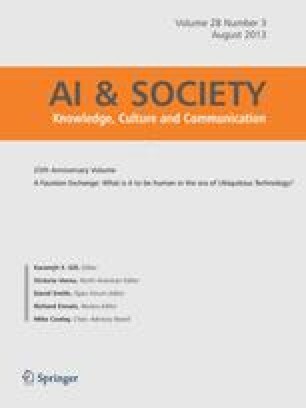 From this perspective, the emergence of knowledge takes placein fine in the expert's mind and is enhanced both by computerised strategies of induction and deduction, and by software abilities to dialogue, co-operate and function as a cognitive extension of the physician's intellectual capabilities. The proposed methodology gives the expert a prominent role which consists, first, of faithfully enunciating the descriptive features of his medical knowledge, thus giving the computer a precise description of his own perception of basic medicine, and secondly, of painstakingly gathering patients into computerised case bases which simulate exhaustive long-term memory. The AI capacities for knowledge elaboration are then triggered, giving rise to mathematically optimal diagnoses, prognoses, or treatment protocols which the physician may then evaluate, accept, reject, or adapt at his convenience, and finally append to a knowledge base. The idea of emergence embraces many issues concerning the purpose and intent of artificial intelligence in medical practice. Particularly, we address the representation problem as it is raised by classical decisional knowledge-based systems, and develop the notions of classifiers and hybrid systems as possible answers to this problem. Finally, since the whole methodology touches the problem of technological investment in health care, now inherent in modern medical practice, some ethical considerations accompany the exposé.